Mouldings, which may be either wood or metal, are ornamental contours given to an object. Mouldings for framing do more than decorate—they hold the glazing, picture, and backing together so that the artwork can be properly protected and displayed. Wood Mouldings have height, width, a back, lip, and rabbet. The illustration below shows what these terms refer to. In the recent past, basswood was one of the most popular woods used in modern framing. But this wood has continued to increase in cost, limiting its use to finer-quality decorative mouldings. From the linden tree, basswood is a soft wood ranging from white to cream in color, and of the many woods used in framing, it has the least apparent grain. Basswood resists splitting, does not warp easily, and can be sanded to a fine finish. It also accepts gold leaf well. Because of its softness, however, basswood is not considered to be the best choice for gallery-style framing. (Gallery-style framing is that which can be handled a great deal without being damaged easily.) Poplar is used as a substitute for basswood because of its similarities, but it tends to warp more. Kiln-dried pine (if pine is not dried properly, its natural resins can leak) is used mostly in less expensive mouldings because of its abundance, although its large resin canals make working with it more difficult. Resin canals sometimes deflect nails, which can result in splitting and the nail can also end up in the wrong place. These canals also make it difficult for even sanding and finishing. Fir is often used as a substitute for pine because of the similarity, but it has a wider grain, which adds to the splitting problem during the nailing of the frame. Although most of these woods are not as soft as basswood, they are soft enough to be of concern if they are to be handled in a gallery situation. Their great advantage is that because of their softness they are more easily worked without expensive equipment. Flaws in cutting the miter are easily covered by compressing the two corners during their joining. Hardwoods do not compress and small flaws in the cutting of hardwoods will not go away. There are many beautiful hardwoods, including padouk, cherry, walnut, maple, and mahogany, that are used as mouldings for picture framing because of their unique textures and colors. The woods discussed here are those most commonly used for picture framing. Ash is a hardwood that is easier to work with than most of the woods in this category. Its color ranges from a cool gray-white to a brownish-red. In the lighter tones the grain looks like a darker version of poplar and in the darker tones, the grain resembles that of oak. Ash does not split easily when nailed or otherwise worked with, which is why many people prefer to use this wood whenever possible. Oak has three color varieties consisting of white, red, and brown. The characteristic coarse grain and pores makes oak one of the most easily recognized woods. It is more popular for decorative artwork than for contemporary artwork because of its strong appearance. It is hard and heavy, has a tendency to split, and is one of the most acidic of woods. Ramin is an evenly grained, light, cream-colored wood. This wood, a recent introduction to the framing industry from southeast Asia, is lighter in weight than most, and does not split as easily as oak. Ramin does not stain well, but can be easily sanded and finished. Because of its soft neutral look, this wood is rapidly becoming popular. Working with raw woods without expensive equipment is within reason for an artist with some basic knowledge of woodworking. Most artists who get a taste of do-it-yourself picture framing, however, usually proceed to go out and find a good professional framer to do it for them. If you are one of the dedicated few who wish to work with raw woods as opposed to finished mouldings, you will have to seal them to help protect against shrinkage, splitting, dirt, and moisture. After mechanical abuse, shrinkage is the next major cause for corners coming apart. Unsealed wood can shrink as much as 5 percent along its length. Raw wood can easily be sealed with hot paste wax, liquid wax, woodworking oils, or any commercial product made for this purpose. As for gesso, lacquer, gold leaf, staining, and painting of woods for picture framing, unless you wish to have a second career as a picture framer, I recommend that you purchase what you want from a picture framer. There are many picture framers who will sell you moulding by the length, or moulding cut and mitered, or moulding cut, mitered, and joined, so that you may assemble the rest yourself. Joining mouldings to make a frame is most easily accomplished by gluing and nailing. It is a common misunderstanding that the nails hold the corners together. The nails only assist in holding the corners together while the glue dries. It is the glue that will ultimately hold the corners together over time, so using large nails or many nails is not necessary and can even weaken the wood. I recommend yellow carpenter’s glue, which is an aliphatic resin. This glue is water-soluble, sets quickly, and is a strong wood glue. Water solubility makes it easy to clean up excess glue that might affect the wood’s ability to accept stains or finishing oils. Aliphatic resins are more brittle than white glues, which are composed of polyvinyl acetate. I feel that with the exception of very large frames, the brittleness of an aliphatic resin is an advantage because it allows a frame to be taken apart for repairs without being destroyed. To avoid splitting and nails working their way to the surface of the moulding, holes should be drilled for the nails before hammering. I recommend, again with the exception of large frames, that you place the nails into the corner in one direction. This will allow you to take the frame apart for repairs. Use the smallest and shortest nails that you can work with and still get the job done. Metal Mouldings are much easier for an amateur framer to work with. They can be purchased precut or cut to order and can be assembled with simple hand tools. If you follow the rules of framing that I have outlined, you can end up with professional results. The major difference between a wood and a metal frame is that you cannot have an airtight seal with a metal frame. This can be a serious consideration if the artwork is sensitive to moisture or air pollutants. In most cases, artwork that is framed with metal, if not placed in a bathroom, on a boat, or in a smoked-filled room at a political convention, should not be greatly affected. Building a setback into a wood frame can be difficult and, if you are paying to have it done, expensive. 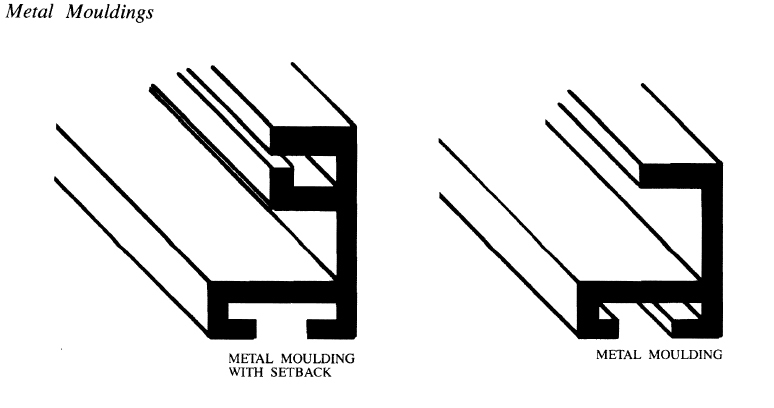 There are metal mouldings that are made with a set-back built into them. (See the illustration above.) This allows for a relatively inexpensive form of conservation framing where the artwork could be float-mounted to museum board and kept away from the glass.